This is Lumiappaday #2. If you don’t know what that is, that’s a segment where I’m showcasing all the WP apps I’ve been collecting but have been waiting for Nokia hardware to put on MyNokiaBlog.com. 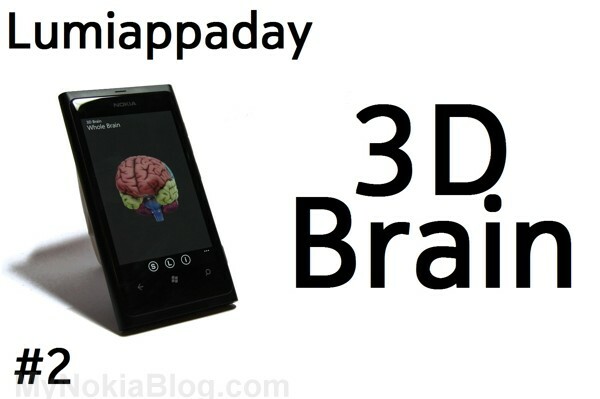 You can navigate to this by going to the Apps category and scrolling down to Lumiappaday. This time I’m looking at an app that I found particularly useful for me. This semester we’re looking at the brain so this app called 3D Brain was quite helpful. BTW, there’s no particular structure as to the type of apps I’m demoing, they’re mostly random. Some more useful than others, some just for fun, some just useful to you if you have a particular interest in something. You get a list of some main structures in the brain, an option to add labels, and a very helpful ‘info’ bit that gives you a lot of information as well as links on that particular region of the brain. The 3D brain part of it is the fact you can rotate this 3D Brain 360 degrees. Half of the brain is cleared out, and whenever you pick an area, half of the brain is cleared except that anatomical portion. I’m really liking that there’s a whole health+fitness as well as education section for medical related apps. Something I’ve been wishing for on Symbian. Design: 7 – Whilst pretty basic, it is nice and clean. Usability: 8 – Simple but it works. Would be nice if you could zoom into the section on top of rotation. Performance: 9 – Fast startup, No crashes, instant resume. I didn’t demo it that well in the video but the rotate is actually a lot smoother. 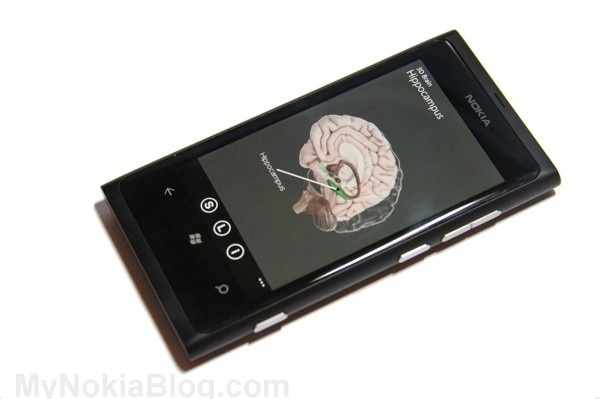 It’s a lot smoother on the beefier Lumia 800 than my Omnia. Price: 10 – This app is free. 😀 There’s no ads either. There’s quite a lot of apps to cover so there will be some days that there’ll be more than one app.